The infographic above was included in the World Alzheimer Report 2015: The Global Impact of Dementia, released on August 24, 2015. Dementias of all kinds are on the rise, despite pernicious and false claims that the rate of dementia diagnoses is stabilizing. With an increasingly toxic planet – air, water, food, soil – our bodies and our brains are suffering irreparable damage over time, and dementias are the neurological manifestation of that damage. Additionally, we have developed lifestyles – processed and fast foods with chemicals, too much salt, and too much sugar, neurologically-altering drugs (prescription and illegal) that have become the rule, not the exception, and increased alcohol consumption and abuse – that are harmful to our bodies and our brains, resulting in the dramatic rise in both physiological diseases and neurological degeneration. With technology addiction and sleep disorders/deprivation layered on top of these, we, as a society, are choosing to further increase the odds of our widespread development of dementias. And to top it off, the general population is getting older – Baby Boomers are about to bust all the rest of us in their old age – and medicine continues its march toward quantity of life (age) instead of quality of life (health). With all of these factors in play, the reality is that most of us don’t stand a chance of not developing some sort of neurological impairment. It may not be full-blown dementia, but most of us are at high risk. In some of these things – lifestyle, technology addiction, sleep habits, quality of life versus quantity of life – we have complete control. Our previous habits may have already done irreparable damage, but we have the choice today to say “Enough already!” and change. The pessimist/pragmatist/realist in me says most of us won’t. I watch myself making every change I can and I watch most of the world around me continuing – even increasing speed and intensity – headlong into the very practices and behaviors we have complete control over that will lead to cognitive impairment. I have sounded the warning here many times. But I realize that I’m just talking to myself. Nobody else cares, it seems. At times, I wonder why I care if nobody else does. Talking to yourself is a waste of time, so I often wonder if I’m just wasting my time with this blog. Maybe I am. But I keep doing the blog because if it helps just one other person on the planet, then that’s one person out of 7.5 billion people that I’ve been able to serve and if I stop, then I stop serving. My conscience and who I am won’t let me do that. And even if nobody wants to hear it now, maybe in a few years, when I’m dead and gone, and their families are watching them go through the journey of dementias, their families will find this blog and it will help them. If I leave a legacy, this might be it. I don’t have high hopes for any legacy. People are so hedonistic and narcissistic now that they don’t pay any attention to anything serious or important. I can only imagine that will get worse in the future too. But even if there’s no use for this information, at least I know I’m doing the best I can to pay what I’ve learned forward and try to help others. The choice of whether they want to learn or ignore is theirs, not mine. What a powerful image! I get your frustration and concern completely. I just wrote about the scary statistics at aliceinmemoryland.com, but I do think there is a growing awareness. What is needed is for all of us who are still “healthy” to volunteer for the studies that are struggling to find participants. 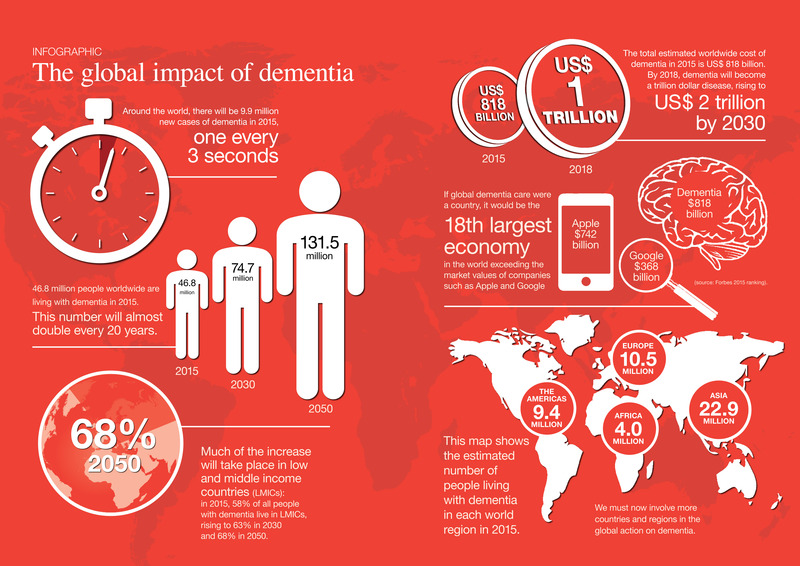 Pingback: Global Dementia Report for 2015 Released | Outstanding Neurologists Near You! I can’t wait to see the tribute to your mom. Very much looking forward to it. And thank you for reading…that helps me know this is not in vain. Sandra, I’ve been following you for nearly 2 years, and learnt much about dealing with people with dementia and other age-related memory issues. After reading your blog recommending “A Deadly Wandering” by Matt Richtel, I borrowed it through our local library, and found it enlightening and thought-provoking. No more mobile-phone use while driving for me, and I’m challenging other habits that undermine my driving concentration. My husband read the Richtel book first and kept saying, “You must read this book!”. He generally doesn’t read ‘my’ books, as our reading tastes differ so much. So you’re not just writing for yourself; you have an appreciative audience, and hopefully readers who also learn from, and think about, what you are saying. Thank you so much, my friend, for your comments and letting me know this is all not in vain and really is helping and serving others. It’s hard to tell at times, and, yet, this is one of missions in my life going forward, so even in my angst of believing that I’m just talking to myself, I still have the responsibility and obligation to continue this. Thank you again.